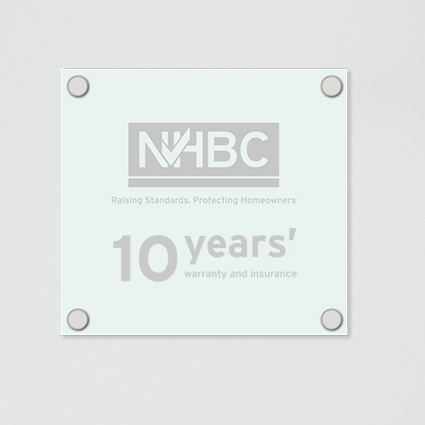 Show your professional commitment with this Buildmark plaque, highlighting that the properties on site are covered by NHBC’s 10-year Buildmark policy. Measuring 193mm x 2015mm, the Buildmark plaque is ideal for site offices, and highlights that consumers will receive deposit protection and 10 years’ warranty and insurance protection. Buildmark is specially designed for newly built and newly converted homes. It provides varying levels of protection for the first owner and any later owners too. Buildmark helps protect the homeowner against certain problems with their home and land resulting from the builder: becoming insolvent or acting fraudulently; or failing to meet the NHBC Technical Requirements (R1 – R5). All builders registered with NHBC must meet the NHBC Technical Requirements which are contained in the NHBC Standards. Buildmark provides pre-completion deposit protection; a two year builder warranty period backed by the NHBC resolution service and guarantee; and then an eight year insurance policy for physical damage to the home caused by a failure to build to the NHBC Technical Requirements. It currently protects around 1.5 million homes in the UK.